This is our 2nd edition of our Newsletter, and what a year! We have launched our new logo, and thanks to all our members who contributed to the process, sending in their own artwork, or sending in logos that they liked – this helped the committee to select a logo which took inspiration from all the feedback we received. Now we have a flowing style logo, which is colourful, stands out and is contemporary to go forward into 2019. The committee would like to thank all our instructors who have been out in all weathers throughout the winter so far, giving great feedback and ensuring our members are improving their skills on a continual basis. We hope everyone had a fantastic night at our AGM. Once again we were well looked after by the team at the River Inn with lovely food, and a chance to catch up with everyone for a night out in January! 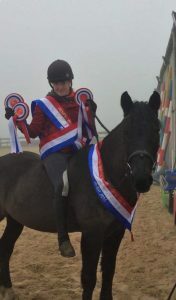 Congratulations to all our Dressage Series and Showjumping Series winners! Both competitions were very close this year and we look forward to another great year in 2019. 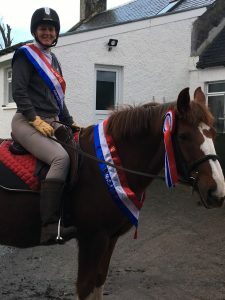 This year we asked both John Cameron and Yvonne Kerr to select the member who they felt had improved the most through the year, these were two new awards for the year – which shows that hard work, determination and regular lessons are a recipe for success, for yourself and your horse. Congratulations to Barbara Cotter our John Cameron Award Winner 2018, and Jan Stanier our Yvonne Kerr Award winner 2018. We thank everyone for the feedback during our discussions on clothing, venues and what you want to do in the coming year. It was great to have a good discussion going, getting everyones input. The committee also put questionnaires on the tables to ensure everyones voice was heard, and we will now collate all this information and see what we can organise for everyone, based on the feedback. We also had a section for possible clothing items and this will helped finalise the selections. We will have samples of each of our products and some sample sizes for members to try on at our Equipilates class on the 8th of March 7-8. We are completing our photos and will soon have all items uploaded onto our shop on the new website. As soon as this is done we will email out to members so as you can order the items you like. Wow, what a year for dressage in 2018. 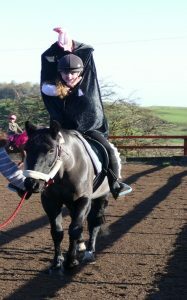 Our series was busy and points in all classes were very tight so well done everyone. 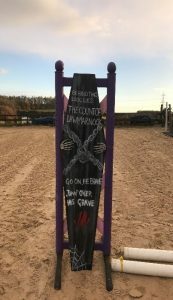 Prior to our Dressage Series in 2019 we are starting off with our test and teach on 10th of March with Linda Barnes. This event sold out in 10 minutes! One of our most popular events to date! 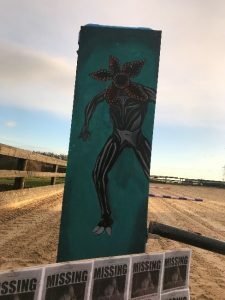 Dressage series 2019 looks to be better than ever with a variety of judges and on our website’s members area, an up to date leader board so that you can all see how close the points really are, what could be better? 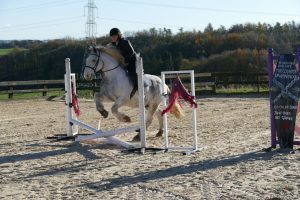 The show-jumping series went very well last season and there were some very impressive performances from our members as you can see from our photo gallery on facebook. 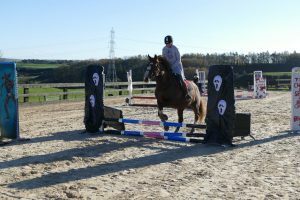 Of particular note, was the Halloween event which included fancy dress and very scary new jumps! Huge thanks to everyone who contributed to making the jumps and setting it all up; it looked amazing and we all had great fun on the day. 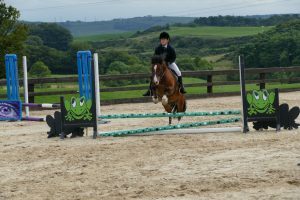 Special mention to both Melissa and Jenni who showed us all how to do the Chase me Charlie, they outlasted everyone else, (and both Juniors), in the end, Melissa won by jumping a massive 1.15!! Check it out on our facebook page! If you are thinking of joining in our series in 2019, please come along, you do not require to be a member to compete in the days competition. 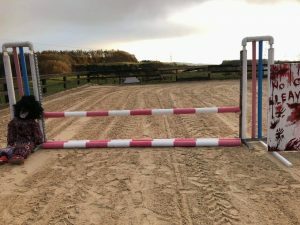 The show-jumping events start with mini cross-poles, so even the most nervous horse or pony can get going in a supportive, fun atmosphere, and jumps go up to 1m plus; so something for everyone! 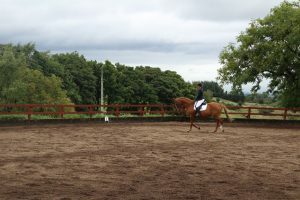 It’s always a good day, usually on the last Sunday of the month, at Lawmarnock Farm (with huge thanks, as always, to William and Edwina Carruth for the use of their excellent facilities) and an excellent way to practice and consolidate skills learned during lessons ☺. Come along and join in the fun! 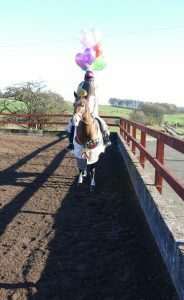 Everyone had a wonderful day at Titwood Equestrian in September, and we were looked after by Mugs and the Titwood team. 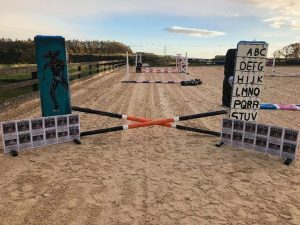 Titwood was perfect as has a great range of jump heights to suit everyone from our beginner cross country group, through to our experienced cross country groups. Everyone loved doing the water at the end of the day – even those who normally swerve round a puddle managed to do it! Huge thankyou to Marie and Baillie who ran our tuck shop for the day, and liaised with Titwood, combining our tuck shop with their Canter and Cupcake day” Each group finished the day with huge grins, which can only be a sign of a great day! Everyone was keen to try and get another date in before the end of the season, but we couldn’t manage to fit another date in 2018. We are booking various dates at Titwood & Houston for 2019 so watch our calendar! 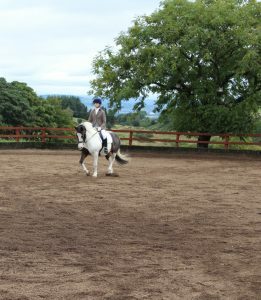 We are hoping to encourage members to compete in some team events this year in Dressage events and Showjumping. 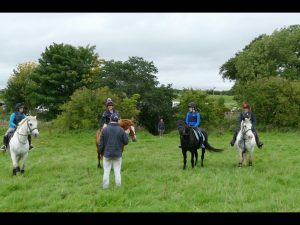 Area One British Riding Clubs will be running various events which we can enter (and can qualify for the National Championships). 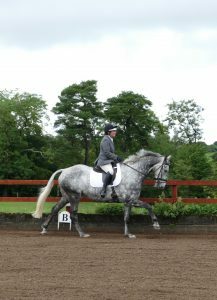 For dressage its teams of 4 all Senior members or all Junior members. There are classes with and without music. 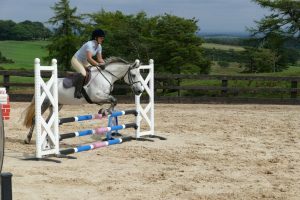 For showjumping, it is also teams of 4 all Senior or all Junior members. 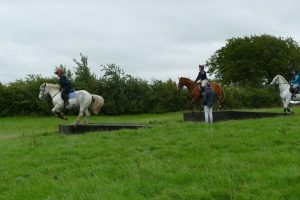 There is also “Style Jumping” for Teams – this consists of 2 Junior & 2 Senior members. 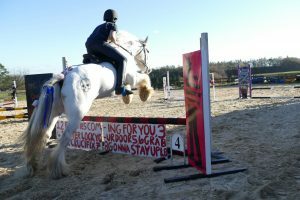 Two of the team jumping at 75cm and the other 2 members jumping at 85cm. Points are given for style! 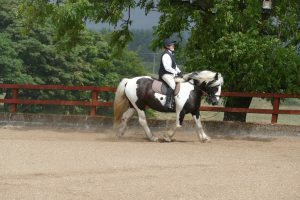 You are also required to ride a dressage test but your riding is scored from a different score sheet. 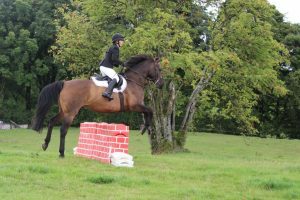 Obviously, we can enter both a Junior and a Senior team for each event if our members are interested in giving it a go. 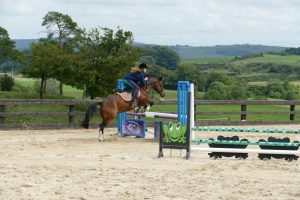 The Area 1 Team Qualifier’s are going to be held at Morris on 6th July (Dressage & Style Jumping) and 7th July (Showjumping). There may be further opportunity to enter team competitions at other non-BRC events. If you see an event for teams that you think we could enter, please advise the committee and we can see who is interested. 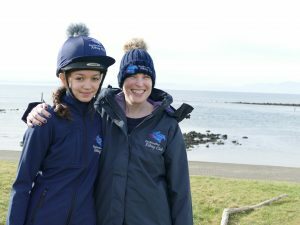 If you would like to take part in the team events for 2019, please email admin@renfrewshirerc.org.uk with Teams as a reference, and please advise what you are interested in competing in eg Novice Dressage Junior or 70cm jumping Senior. We certainly picked the best day for our trip! We had a fantastic time with many laughs on and off the bus. 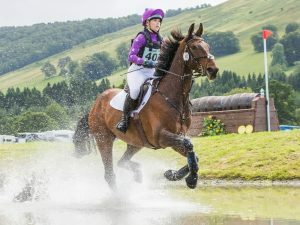 The cross country was a highlight of the day for many, and we managed to see some famous faces doing some seriously scary jumps! 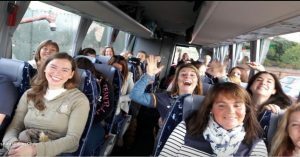 If you didn’t manage to come along this year, definitely put it in your diary for 2019, fun day out and you can relax and have some bubbly while watching the competition and relax on the bus on the way home. 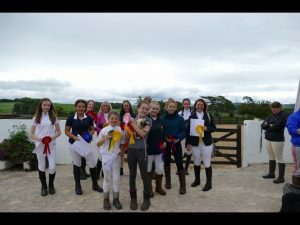 In August we ran our combined event with both Dressage and showjumping and it was a massive success. We had a very large turnout and it was great to see those who normally stick to one discipline giving something new a go! Many were surprised how well they did try something new. Following the success of the day, we are going to run this event again in August 2019, so watch out for this in the calendar and keep the date free. 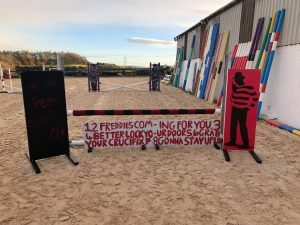 A Huge thank you to all our club members who gave their time to manufacture our superb, super scary front of wing panels, fillers, and accessories. 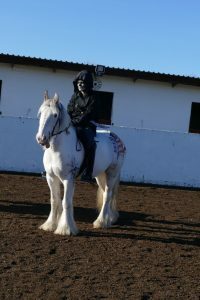 A very, very big thank you especially to Joanna, Nina, Cara and Edwina who showed us their artistic skills making our Halloween Event amazing. 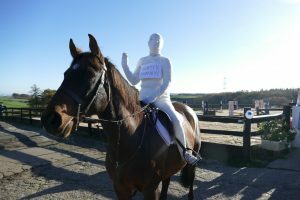 Everyone who attended the event was impressed (and scared!) 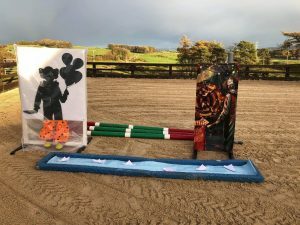 of the themed jumps – however, it was proven that the horses are not bothered about the fillers/wings – it’s the rider who gives your horse the confidence to go forward. 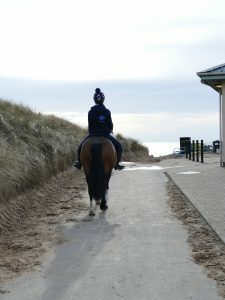 We had a fabulous day with hardly any refusals. 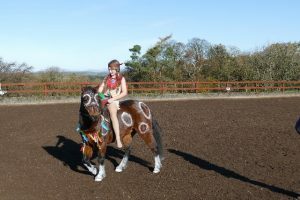 Well done also to everyone who entered our fancy dress! The costumes were all amazing and a lot of thought and work had gone into the costumes, it was really fun and good to see everyone in the spirit of the day! Amazing Deals for RRC! 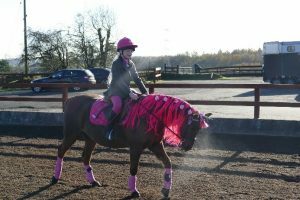 10 % Discount, Amazing Saddlery, Unit 1, Riverpark Industrial Estate, Bridge Street, Linwood, PA3 3DW. Every Thursday, 10% Discount, At Jet Set if you show, Your membership card, 6a Ploughlands, Dundonald, Kilmarnock, KA2 9BT. 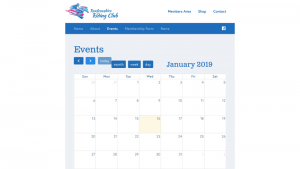 Remember to keep eye on our website calendar page to keep up to date with all the events for 2019.